Why do so many of you have to sign up??? Just one day after launching in the US, Beats Music has shut the door on letting new users join in the streaming music fun. Bugs, crashes and glitches have been occurring for enough users that Beats has decided to do something about it. "Most people are unaffected but our priority is to give everyone a great experience," wrote Ian Rogers, CEO of Beats Music, in a "Service Update" blog post. "We prepared for issues like these, have a plan, and are going to hold off on letting more people in while we put this plan in action." 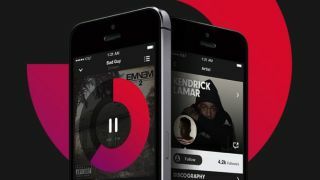 In practice, those who joined Beats Music January 21 can continue using the service. New users can still download the app from the App Store or Google Play, but they'll have to register and wait for word that invites them "back in." The silver lining here for new folks is Beats Music will tack on an extra seven days to their free trial. According to Rogers, Beats Music took the crown of No. 1 Music App in the iTunes Store. Music lovers, it would seem, are flocking to Beats beats in droves. For those who registered their username before the app launched, Rogers assured those are still reserved and that the company will reach out when the kinks have been ironed out. The CEO's note may have come in the nick of time; commenters on his post assail the launch as "horrible." Others expressed understanding, something Rogers seems to be seeking. "We're staying focused on bringing you the best music experience from the people who know what song comes next," his post concluded. "Stay tuned, and thanks for being excited about Beats Music." The Roku 3 may be the little black box for you.